Upgrading from your usual category stateroom is a dangerous game. You start off on your first cruise in an inside room thinking, “I’m just happy to be on the ship! How much time will I spend in my room anyway?” On your next cruise, you upgrade to an oceanview for one cruise and realize you can’t ever go back to a room where there are no real windows. Then, just once, you decide to splurge for a verandah—and now you never want the terrible inconvenience of walking up a few decks to be outside in the glorious ocean air. Well, let me tell you those upgrades were but a hop compared to the Grand Canyon jump that is concierge. After my recent sailing in a one-bedroom suite on the Dream (all the suites are “concierge” on Disney Cruise Line), I’m pretty sure I’m going to feel like I’m sailing in a closet in my oceanview stateroom on my upcoming Thanksgiving cruise! 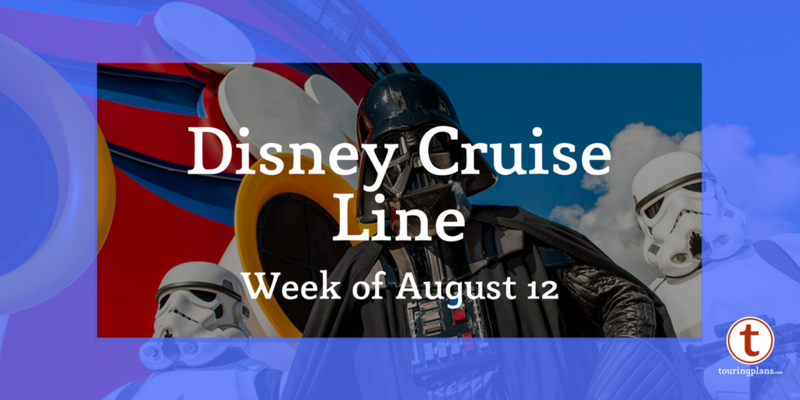 Recently, I was lucky enough to split the cost of a one-bedroom suite on the Disney Dream with a friend on a 4-night, off-season cruise, and my cost wasn’t ridiculous. There are times when the additional cost has passed ridiculous and found full-blown disbelief. Price out the Roy Disney Suite on a longer summer cruise and you’ll be convinced there must be a typo or horrible glitch in the system. No one really pays that right? Actually they do. Concierge sells out all the time. There are reasons it costs more though. And for some people, it’s worth it. 1. 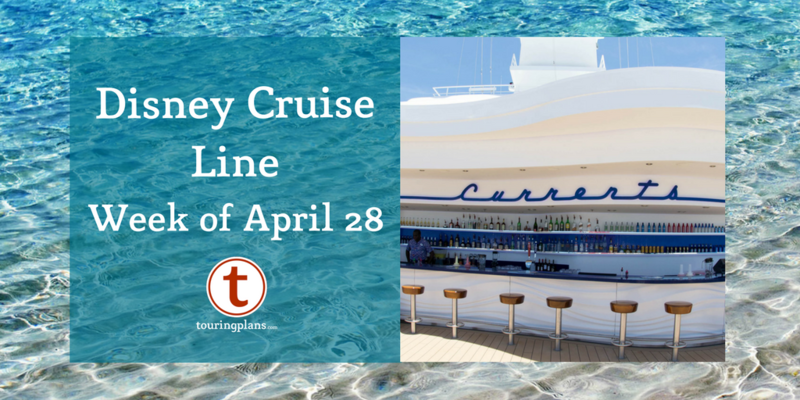 Embarkation Day is Super Smooth – For those of you that are frustrated by picking arrival times to the port, you may like to know that concierge guests do not pick an arrival time, they can arrive at their leisure. Once there, they also have a separate check-in with minimal to no waits. After concierge guests check in, they are welcomed into a separate lounge reserved just for them while awaiting boarding. When the ship is cleared, before boarding numbers begin to be called, the concierge guests are led through a side door and up the gangway. When we boarded the Dream, we took our boarding picture quickly and were literally the first guests onboard the ship. The concierge guests gather in an empty lobby and are then escorted upstairs to the concierge lounge on Deck 12 by one of the concierge hosts. They are met there by some of the ship’s officers and the rest of the concierge team. There are snacks and drinks (both non-alcoholic and fully alcoholic), and the concierge hosts meet with each family to go over everything they have booked beforehand to see if they would like to add anything. It’s quite the luxurious way to start a cruise. 2. There’s a Concierge Lounge on the Dream and the Fantasy – The lounge on the Dream and the Fantasy is open from 7 am to 10 pm. There are snacks several times a day, a continental breakfast, fruit, unlimited canned sodas, specialty coffees, teas, and hot chocolate. A host is always in the lounge seemingly waiting for you to come in and ask for something. There’s no waiting in line at guest services for concierge guests since the concierge host in the lounge can print your bills, schedule tastings, just about anything guest services can do! There’s a cocktail reception every night with snacks and complimentary drinks. The lounge is a great place to unwind and feel pampered. 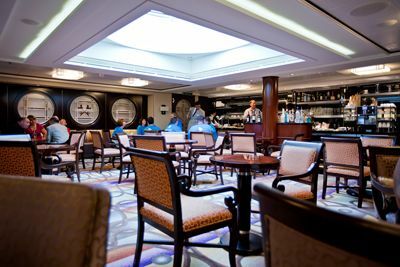 Sadly, there isn’t a concierge lounge on the classic ships, and I say “sadly” because the lounge is quite the benefit. Instead, on the Magic and the Wonder, there is a concierge welcome reception held in one of the nightclubs. 3. Ability to Book Onboard Activities Early – Concierge guests’ booking window for onboard activities technically opens at the same time as Platinum Castaway Club Guests (those who have sailed more than 10 times before), but in reality, shore-side concierge grabs things before they are released online (What is shore-side concierge you ask? They are the superb staff guests have access to as soon as a concierge room is booked.) While this will still leave plenty of availability for most activities, it’s made it all but impossible for non-concierge guests to get one thing in very high demand – a cabana on Castaway Cay. Like it or not, if you want a cabana, sailing concierge is about the only way to mostly ensure that will happen. Even if you don’t want a cabana, sending the concierge team a list of all excursions, adult-only restaurant reservations, spa treatments, and anything else that you would like at approximately 125 days before your cruise, is greatly preferable to staying up until midnight and frantically booking everything yourself online when your booking window opens. Instead you can sleep and, in all likelihood, wake up to an email from shore-side concierge letting you know that everything is booked and taken care of. 4. Incredible Rooms – While the rooms vary between the Magic/Wonder and the Dream/Fantasy, all concierge rooms are nice. On the Magic and the Wonder, all concierge rooms are suites. On the Dream and the Fantasy, there is a category (Category V) where the room is basically the same size as the regular Category 4 – Deluxe Family Oceanview Stateroom with Verandah – that sleeps up to 5. The decorations and colors are different, but the layout is the same. 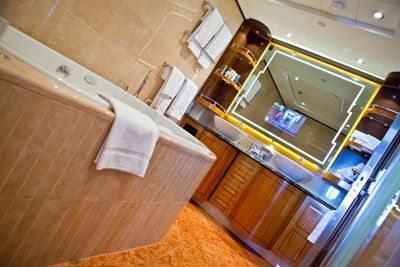 On all four ships, the suites however are like a whole new world. They’re beautiful and spacious. The size of the Category T – Concierge One Bedroom suite with Verandah – on the Dream had me grinning like a little girl. I think I said at least 10 times in the first hour, “Oh my word this is huge.” Our suite had two full bathrooms, a dining room, vanity with a bench seat, desk and 3 TVs. Three. The tub was bigger than the entire bathroom my tub was in on the Wonder. I cannot express enough how much room we had and how gorgeous the room was. 5. Concierge Sundeck – On the Dream and the Fantasy, Disney created a private sundeck with large, comfy lounge chairs. It’s accessible from Deck 13 with a concierge Key to the World card, or directly from the concierge lounge. It’s very quiet and chairs are plentiful. The only thing that would make it better would be a water feature, but for those whose main desire is just to lay out, the concierge sundeck is perfect. 6. More Free Internet – Lately Disney has been giving all staterooms 50mb of free data to use onboard as long as you sign up on the first day. If you are staying in concierge you will get an additional 100mb. If you are staying in one of the category R – Concierge Royal Suites, you will get unlimited internet. Pro tip: sign up right away for your free data when you are sailing DCL, but make sure to immediately sign out so you don’t use it up at the embarkation port when you almost certainly still have good cell service! 7. 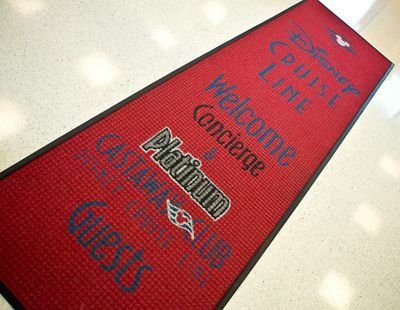 Special Character Meets – On many sailings, there will be a special meet and greet with a “Disney Friend”. Characters have been known to pop in to other concierge receptions from time to time as well. Semi-private character meet and greets are nothing to sneeze at! 8. 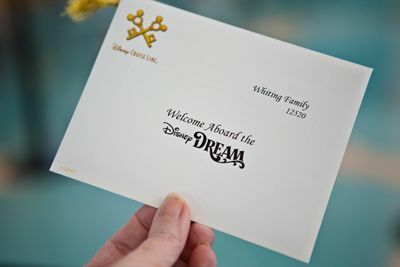 Special Dining Opportunities – Guests staying in concierge rooms with a dining table (all concierge rooms except category V on the Dream and the Fantasy) have the option of having dinner from any of the main dining rooms delivered to their room. If you feel like sitting in your room and eating dinner in your pj’s, but don’t want to miss out on, say, the pirate menu, here’s your chance! Guests staying in the Royal suites can even order Palo into their rooms! Chocolate Soufflé, in your room. I might never leave. Concierge guests can also order breakfast from room service on the last morning. For everyone else, room service closes at 1:30 am the last night. 9. 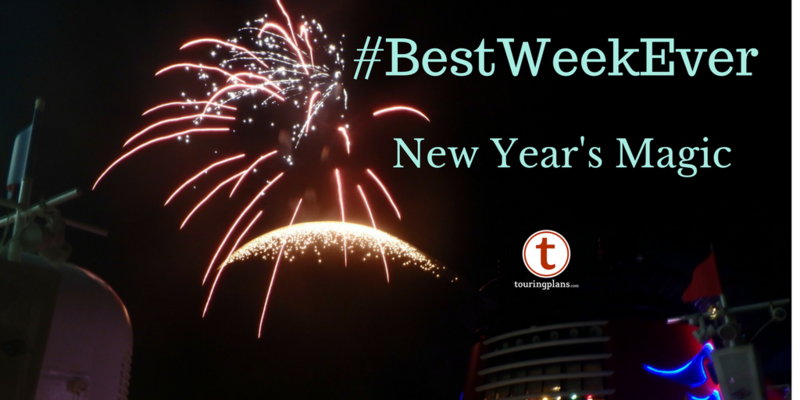 Whole Other Level of Service – If you’ve been on a Disney cruise, you were probably amazed by the friendliness and helpfulness of the crew. Well I’m here to tell you, the concierge crew is a whole ‘nutha level (HNL as my family calls it). They will blow you away. Every time we stepped into the lounge they greeted us by name and sat down to talk to us. One took his time helping me figure out why I was blowing through my internet data. Another was worried we would be late for our parasailing excursion and called a golf cart to give us a ride to the meeting place. I could not be more impressed by them and their helpfulness. 10. Parting Gift – There aren’t any guarantees here, but let’s just say it would be unusual to disembark without a parting gift from the concierge team. 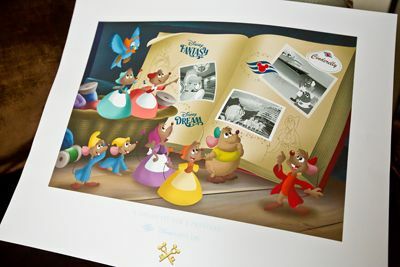 We got a great Don “Ducky” Williams print that’s personalized for concierge guests. If you have the means and you are asking if it’s worth it, do it. What’s worth it to one will not be to another, but if you can afford it, it’s absolutely worth a try. I’d do it again in a heartbeat. Just remember, you run the risk of never wanting to sail again in a normal stateroom! Have you sailed concierge? Was it worth it to you? 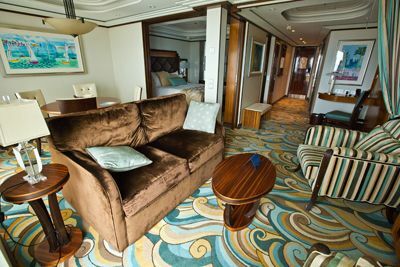 How does a 1 bedroom suite on fantasy/dream compare with 2 connecting veranda staterooms in terms of price and space? Our kids sleep better when not in the same room so we always get 2 rooms/sleep spaces when traveling. Is there space for a separate toddler bed in the master bedroom (we don’t have them sleep in bed with us either due to the high foot-in-face risk). I would so love the concierge service but fear the 1 bedroom wouldn’t meet the primary goal of seperate sleep spaces for the kids. The 1-bedroom suites on the Dream/Fantasy have a fold-out Murphy bed + a double sleeper sofa. That’s 2 beds in addition to the queen in the master bedroom. The spaces can sort of partition off. The bedroom has slider openings. If you look in the whole room picture above you can see a curtain pulled back on the right. This curtain can create a “room” where the sofa bed is. The Murphy is on the other side of that curtain. There’s not space within the bedroom itself to do anything other than walk around the bed. Kelly nailed it for space. For price, two verandah rooms are often (though not always) cheaper. Thanks to you both for the info! Alas it looks like a suite isn’t in our future. I just looked at our dates and the 1 bedroom suite cost is more than twice what we are paying for 2 veranda rooms. Sigh.